" We live or die through our people. They decide if — or if not — someone should do business with us, rather than someone else." This program outlines specific and workable strategies to better manage your employees—your talent. It focuses on the understanding that your employees drive your organization. They are your front face. By increasing the percentage of producers who work in your organization and decreasing the percentage of destructive “bodies,” your organization benefits immeasurably. Producers speed up the decision making process. They enable a faster response to change. They capacitate a more effective use of resources and assets. With employees committed to your mission, with staff engaged and happy to come to work everyday the possibilities that can be achieved by you and your organization are limitless. In today’s marketplace engaged employees are the magic bullet for success. They are your producers. What percentage of your employees are producers? What percentage are fence-sitters? – they don’t hurt your enterprise, but they don’t really help either. What percentage are intractable? – they are the rocks that actually damage your organization. All employees start out performing as producers. What one thing can you change in their work environment to encourage them to remain producers after the honeymoon phase is over? Discover new strategies to increase the percentage of producers working in your business and decrease the percentage of fence-sitters and rocks. Develop innovative strategies to build a company of leaders. Use producers as a competitive advantage to engage and loyalize existing customers, as well as find new customers. Recognize and utilize innovative strategies to hire and retain producers in your company. Utilize effective strategies to increase the percentage and passion of producers in your company in order to build a confident and action oriented team who take on challenges and contributes to the overall growth and profitability of the organization. Employ producers to influence fence-sitters and rocks and move them positively toward productivity. Use this producer attitude as a competitive advantage. 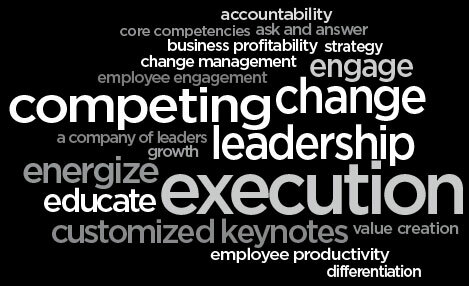 Utilize the power of “we.” Grow and maintain a highly competitive company of leaders.